Over 9,000 satisfied customers worldwide save money and get their parts when they need them. Over the last several years, BandSawParts.com has developed one of the finest reputations anywhere in the band saw replacement parts aftermarket. With a strong value proposition built on prompt and courteous service, unequaled expertise, and attention to detail, simply put, you'll get more for your money. Stocking an expansive selection of replacement parts for brand-name machines, along with parts for almost every other major band saw manufacturer tells you we keep pretty good company. So call or visit our web site today. We're confident once you experience our friendly service and quick delivery, you won't be selecting your supplier as an afterthought. In fact, you won't have to give it a thought. Our goal is simple: Supply our customers with the right part, at the right price, right on time; Every time! We welcome the opportunity to prove ourselves with each and every order we ship because your satisfaction is the only true measure of our success and is the reason our reputation continues to grow. 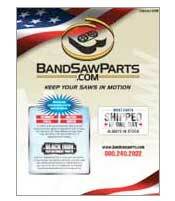 Visit BandSawParts.com today, and join the crowd that’s over 9,000 strong and counting. In keeping with our high standards of service, we are constantly adding different band saw repair parts to our ever-growing inventory. 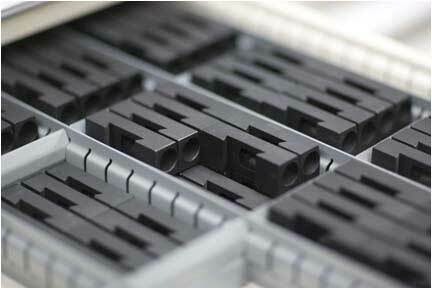 We specialize in Marvel aftermarket bandsaw replacement parts, and also carry a large selection of blade guides. Amada bandsaw blade guides, HEM saw guides, Marvel blade guides, Marvel roller guides, and Hydmech parts as well as the hard to find DoALL bandsaw blade guides replacements. All are all part of our expansive inventory. No part numbers - No problem! Just contact us with as much information as possible about your band saw and the part you're looking for, and we'll find it! Our Houston operation boasts a full machine shop in order to produce custom order aftermarket replacement parts. The right people and the right tools, gets you the right part on time, every time. We are always here, and ready to help! With the recent addition of a Gleeson 12B bevel gear cutting machine, we now have the ability to produce finished drive and pinion gears with greater precision and control over quality and production. In addition to our extensive line of aftermarket replacement parts, we stock a full line of sawing fluids, and offer field repair services as well. All designed to do one thing: "KEEP YOUR SAWS IN MOTION"! and help you stay competitive in a difficult economy. From bearings, belts, and band wheels, to our specialty band saw guides, we always recommend using the parts that are right for your saw to keep it performing efficiently. If you don't know what you need, give us a call. We are always here to help. Need it fast? We ship same day service with most items in our inventory.